The addition of a high-quality AEC algorithm to our internal DSP is the main differentiating feature of the Voice Tracker II Array Microphone, but it has several other attributes as well. Since the Voice Tracker automatically and electronically steers a listening beam to the active talker, it knows the location of the talker. In the Voice Tracker™ II this information is made available outside the DSP as a RS 232 serial word through a DB-9 Jack. A sophisticated customer can use this information to point a camera, or turn the head of a robot toward the talker. Note that Acoustic Magic does not provide any algorithms for the use of the location information. There are two value proposition for the Voice Tracker II in conferencing applications. The first is its ability to pick up talkers as far as 20 feet away from the microphone, with a 360° field of view. Conventional conferencing systems like the Polycom really use only one microphone at a time and have limited pickup range. The second is acoustic echo cancellation (AEC). In a conferencing application, acoustic echo cancellation is vital. Acoustic Echo occurs when the far end talker's voice is picked up from the loudspeaker in the near end and sent back to the far end as an echo. Some VoIP products have good AEC, and in those cases you can use a Voice Tracker I. But if they do not have a robust AEC, the Voice Tracker II, which has its own internal high-performance AEC, remedies the problem. The value proposition is similar to that for conferencing. Often the Voice Tracker two is connected directly to a camera, which has no AEC capability, so the AEC feature is even more important. EMR for doctors important application for automatic speech recognition. The microphone most used for this application is a Phillips speech mic, which is a handheld device. Many doctors (and lawyers) want to be hands-free (or headset free). In those cases the Voice Tracker II is ideal. It does not take up much space on the table and it's very effective for recognition accuracy at ranges up to a few feet. Because the Voice Tracker II is so portable (it is relatively small and could be powered by the USB in the laptop) it can be used by deaf students to get translations (by sign language) in classrooms. For additional application ideas, scan our user comments page. NOTE: For the voice Tracker II to work on a mac you have to use a USB audio output adapter. There is nothing special about the USB adapter. Just connect the analog audio signal to the pink Jack and the USB plug to the PC or Mac. People use our Voice Tracker array microphones to record meetings, or for conferencing, because of its long pickup range (20 to 30 feet) and 360° field of view. Our Voice Tracker array microphones are designed to be connected to PCs or other devices either through a 3.5 mm analog audio connection (through a soundcard) or a USB connection. The Voice Tracker I has only an analog output, but can he be easily converted to USB using a USB adapter like our part 102A. The Voice Tracker II has both an analog audio output and a USB audio output. Their analog outputs are at mic level, with low impedance, and work well with sound cards. The boost in the soundcard is designed to bring the output up to usable levels. High levels of boost can be employed because of the good signal-to-noise ratio in the microphones. From time to time we have received inquiries about connecting the Voice Tracker microphones to an iPhone (or other smart phones). Initially, this couldn’t be done because the iPhone required a very specific output impedance from the external microphone. If the impedance didn’t match what the iPhone was looking for, it would default to the built-in microphone. Fortunately, impedance matching connectors have become available to eliminate this roadblock. We have tested an “ iPhone 1/8 inch microphone adapter to 3.5 mm four conductor TRRS male” adapter from KV connection (part number code KM-iPhone-mic), and it works just fine. Similar adapters are available from other manufacturers. Rode has told us that their adapters also match the iPhone’s impedance requirement, but we have not tested one. Note that when the KV connection adapter was connected to the iPhone, we lost the speaker output. This can be corrected by first connecting a” 3 .5 mm 4 pin to 2 x 3 pin 3.5 mm headset splitter adapter” to the iPhone. This adapter is available from companies like StarTech. The arm labeled microphone was connected to the Voice Tracker, and the arm labeled headset was connected to our PC speaker to create a long-range speakerphone with the Voice Tracker I as the mic and the PC speaker as the speaker. Consequently, the Voice Tracker can pick-up questions from the class as well as lecture from the professor, enabling more than 350 schools and universities to choose the Voice Tracker I for lecture recording. Or, it can pick up questions from the audience in town meetings or comments around a board room conference table for meeting recording. The long pickup range and wide field of view make the Voice Tracker ideal for conferencing applications as well. The Voice Tracker I can be used as an auxiliary microphone with conventional conferencing systems that have a good AEC. The Voice Tracker II has its own built in AEC, and consequently can be used with VoIP systems that do not have a robust AEC. Voice Tracker Array Microphones can also be used for a hands-free/headset free automatic speech recognition with full vocabulary dictation products like Dragon NaturallySpeaking. The Voice Tracker’s long range make it ideal for home automation applications where a whole room has to be covered for command-and-control recognition. 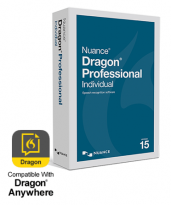 I have used Dragon NaturallySpeaking on a daily basis in my work as a securities litigator for at least a dozen years. During that time I have experimented with many microphones looking for the optimal combination of accuracy and comfort. I have at last found that optimal combination in the Acoustic Magic microphone array. In an office environment where external noises can be excluded (such as by closing a door) Acoustic Magic is as accurate as the best wired headset microphones (and better than wireless headsets), but without the inconvenience and discomfort of wearing something on your head/ear. I heartily endorse Acoustic Magic for any serious user of voice recognition software in such an environment.